Two weeks ago, I mentioned The Power of Darkness: Tales of Terror, by Edith Nesbit, a volume in the Wordsworth Tales of Mystery And The Supernatural (or, as we prefer to call it, TOMAToS). I first discovered Wordsworth’s excellent Tales of Mystery And The Supernatural line, believe it or not, wandering the floor at the Windy City Pulp and Paperback show in Chicago with fellow pulp aficionados Howard Andrew Jones and John C. Hocking. We’d just passed a dealer selling omnibus collections of Ki-Gor reprints — which heartily tempted Howard, let me tell you — when Hocking became distracted by a thick volume on display amidst a vast sea of books: The Beast With Five Fingers, by W.F. Harvey. 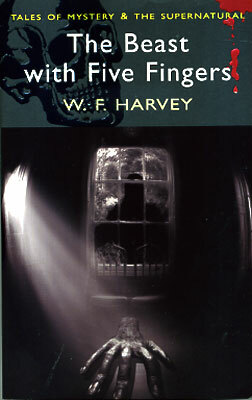 I’d never heard of Harvey, although he’s fairly well-known in pulp circles for the short story that became The Beast With Five Fingers, a 1946 creeping-hand horror flick starring Peter Lorre. Hocking’s excitement had nothing to do with the cover story however, and everything to do with “The Clock,” which he described as one of the finest horror stories ever written. That was enough for me, and I took home a copy. I think that for sheer menace this is the most powerful story I have ever read, though exactly what it is that is menacing, and exactly what it is menacing to do are entirely mysterious. I’m happy to say that the story lives up to its reputation. It’s a tiny marvel, splendidly written, about a mysterious and macabre encounter in an abandoned home. Or is it? Like much of the best gothic fiction, exactly what happened is open to interpretation. The Beast with Five Fingers was published by Wordsworth Editions in May, 2009. It is 432 pages in paperback, priced at a criminally low $6.99. There is no digital edition. You can see all of our recent Vintage Treasures here. Unfortunately, ‘Tales of Mystery and the Supernatural’ are on the chopping line. Only two titles planned for next year, and future of the line unknown. I third that recommendation for The Clock. That is a wonderful short little horror story. I’ve had less luck with the rest of the collection — John, which ones did you really like? The Clock is such a masterful short piece that it puts the other tales I’ve read by Harvey in the shade. Not that his other work is bad, it just seems soft in the shadow of The Clock. Strange that such a small story could have such prodigious weight. Truly one of the finest examples of what H.P. Lovecraft called ‘spectral fear’ ever put on the page. I can’t think of another tale in which a set of disparate impressions are perceived by the protagoinst (and the reader), and fail to add up, to make any kind of logical, coherent picture. And the result is deeply, seriously uncomfortable. There’s something in the house, but what it seems to be doing now, what it seems to have been doing in the past, and the sounds it seems to be making outside the door, simply do not come together in a way that makes any kind of earthly sense. The narrator doesn’t want to know what it is. I do not blame the narrator one little bit. The other story by Harvey that has garnered almost as much acclaim as The Clock is August Heat, which is also in this collection. I meant to read it this last Halloween and did not. I’m saving it for a rainy night. > I’ve had less luck with the rest of the collection — John, which ones did you really like? “The Clock” is the clear winner so far. But Harvey’s prose style is consistently solid (at least, among those I’ve read so far), even if the other stories don’t have the same impact. After Hocking’s suggestion, I’m eager to try “August Heat” next.